Mekong River travel adventure book released in its first English translation. Author George Groslier—quintessential witness to colonial Cambodia—describes his 2,000 km river journeys in 1929 French Indochina. "Water and Light–A Travel Journal of the Cambodian Mekong" by George Groslier. DatAsia Press, 2016. In 1929, author and artist George Groslier set out by boat to inspect Buddhist pagodas along two-thousand kilometers of the Cambodian Mekong. Groslier—among the first French children born in 19th century Phnom Penh—spoke fluent Khmer and by then was recognized as a quintessential witness to colonial Cambodian life. Months later he returned with rare photos and a 600-page travel diary filled with first-person impressions. As Groslier accurately pointed out in his original preface: “I could even claim that a tour like this will perhaps not be undertaken again anytime soon…if ever again…the old Cambodia has been so thoroughly upset by Western influence.” Indeed, such a journey was not, and could not be repeated. His experiences remain unique. 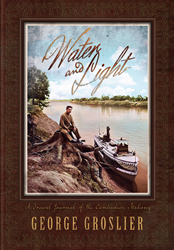 On February 4, 2016, "Water and Light–A Travel Journal of the Cambodian Mekong" appears in English translation for the first time, simultaneously commemorating the 129th anniversary of George Groslier’s birth. A basic version of his travelogue was previously published in French as "Eaux et Lumières" to coincide with the 1931 Paris Colonial Exposition. Groslier dedicated his life to the arts of Cambodia, founding both the country’s National Museum and School of Fine Arts. Tragically, only weeks before the end of World War II, Groslier died in a prison camp under Japanese torture. Following his murder, Groslier’s entire catalog of eighteen rare books about Southeast Asia fell into obscurity. "Water and Light–A Travel Journal of the Cambodian Mekong" by George Groslier was edited by Kent Davis, with foreword by Henri Copin, and literary translation by Pedro Rodríguez. The book features more than 70 hand-tinted illustrations, including Groslier’s original photos; appendix articles by Paul Boudet, Dr. Paul Cravath and Solang Uk; and the complete original French text. First Edition. Florida, USA: DatAsia Press, 2016. Published simultaneously in the UK and USA. ISBN 1934431877. US$34.95. Four other George Groslier titles are available in English from DatAsia Press: "Cambodian Dancers–Ancient and Modern" (2011); "In the Shadow of Angkor–Unknown Temples of Ancient Cambodia" (2014); "Return to Clay–A Romance of Colonial Cambodia" (2014); and Road of the Strong–A Romance of Colonial Cambodia (mid-2016).